"The Personality of Godhead Śrī Rāma assumed the form of a human being and appeared on the earth for the purpose of doing some pleasing work for the demigods or the administrative personalities to maintain the order of the universe. Sometimes great demons and atheists like Rāvaṇa and Hiraṇyakaśipu and many others become very famous due to advancing material civilization by the help of material science and other activities with a spirit of challenging the established order of the Lord. For example, the attempt to fly to other planets by material means is a challenge to the established order. The conditions of each and every planet are different, and different classes of human beings are accommodated there for particular purposes mentioned in the codes of the Lord. But, puffed up by tiny success in material advancement, sometimes the godless materialists challenge the existence of God. Rāvaṇa was one of them, and he wanted to deport ordinary men to the planet of Indra (heaven) by material means without consideration of the necessary qualifications. He wanted a staircase to be built up directly reaching the heavenly planet so that people might not be required to undergo the routine of pious work necessary to enter that planet. He also wanted to perform other acts against the established rule of the Lord. He even challenged the authority of Śrī Rāma, the Personality of Godhead, and kidnapped His wife, Sītā. Of course Lord Rāma came to chastise this atheist, answering the prayer and desire of the demigods. He therefore took up the challenge of Rāvaṇa, and the complete activity is the subject matter of the Rāmāyaṇa. 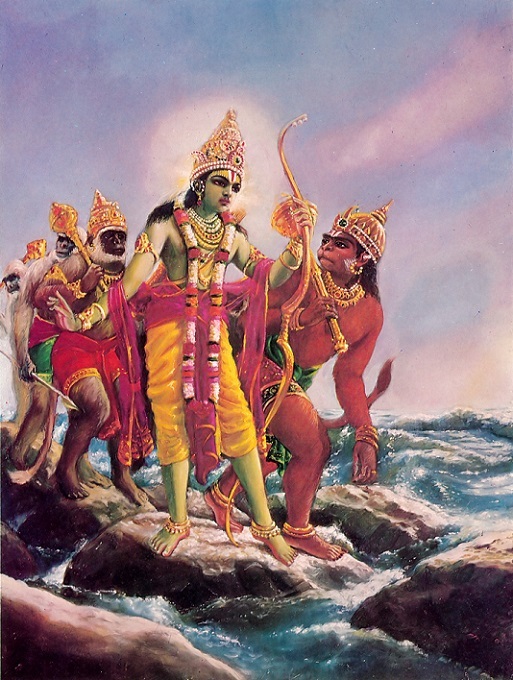 Because Lord Rāmacandra was the Personality of Godhead, He exhibited superhuman activities which no human being, including the materially advanced Rāvaṇa, could perform. Lord Rāmacandra prepared a royal road on the Indian Ocean with stones that floated on the water. The modern scientists have done research in the area of weightlessness, but it is not possible to bring in weightlessness anywhere and everywhere. But because weightlessness is the creation of the Lord by which He can make the gigantic planets fly and float in the air, He made the stones even within this earth to be weightless and prepared a stone bridge on the sea without any supporting pillar. That is the display of the power of God."